The collapsed Morandi Bridge is seen in the Italian port city of Genoa, Italy, Aug. 15, 2018. Italian authorities said Wednesday at least 37 people died in Tuesday's highway bridge collapse in Genoa. Several people were still missing as rescuers continued to search through the rubble from the fallen section of the Morandi Bridge, which came down during a violent storm. The collapse sent dozens of cars plunging 45 meters, while huge pieces of concrete and steel fell onto warehouses in an industrial park below the bridge. According to authorities, all of the deaths involved drivers on the bridge and no one standing near it was killed. Cars are blocked on the Morandi highway bridge after a section of it collapsed, in Genoa, northern Italy, Aug. 14, 2018. 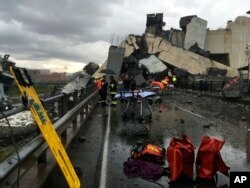 A large section of the bridge collapsed over an industrial area in the Italian city during a sudden and violent storm. Italy's Transport Minister Danilo Toninelli cast blame Wednesday on the company that manages the bridge, Autostrade per l'Italia, saying the company did not live up to its contract. Toninelli also said the government would launch a nationwide inspection of all aging bridges and tunnels. Deputy Prime Minister Matteo Salvini said Tuesday's disaster shows Italy has to spend more on its infrastructure, even if it means breaking EU budget rules. "We should ask ourselves whether respecting these limits is more important than the safety of Italian citizens. Obviously for me, it's not," he said. "They will have to pay — pay for everything, and pay a lot."